This morning Jan asked for my potato and leek soup with chicken. I have done that and this blog always pushes me to try something new. What could I do that both answered Jan’s desire, but also be completely new and different? Yesterday, I picked up Eilene from her friend’s house. Now some teenagers might sit in sullen silence for the ride home, but Eilene spends the time talking a mile a minute on anything that comes into her head. Within this cascade of sound, she mentioned how she had been cooking with her friends and how much she liked/wished she had added curry powder to the dish they had been making (see Eilene, I do actually listen). Now, I could have just added the curry powder to my usual soup and called it good, but I did not stop there. I had spent much of my morning going through Foodily searching for lamb meatball recipes. Foodily is a recipe search site that brings multiple recipes together side by side for easy comparison. Most of the recipes will be variations of the basic theme, however occasionally you will get an unexpected result. In this case, the odd man out was a lentil soup. It did have leeks and potatoes, but it was not like all of the other recipes that came up. While I did not want to make that lentil soup, it did start me thinking about replacing the potatoes with red lentils. 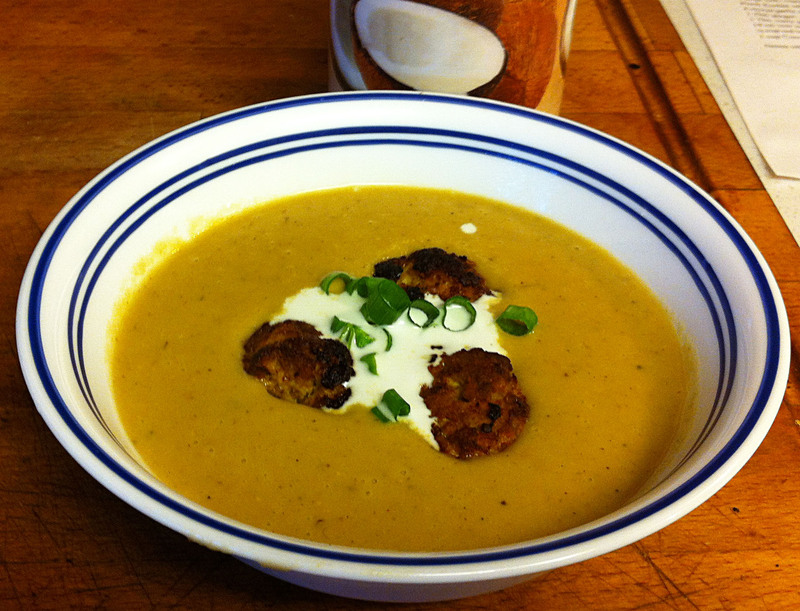 This would make the soup closer to an Indian dal, rather than a French vichyssoise. When I have made my Chickyssoise in the past, I would simply fry the chicken breasts, chop them up and throw them into the soup at the last minute. Today, as I was looking for lamb meatball recipes I came across one that called for putting the meatballs into a yogurt soup. Given the Indian bend my soup was taking, I decided that tandoori flavored chicken meatballs would add a bit of color, texture, and flair to my dish. I have two tandoori spice blends in my cabinet. I decided to use the Everest Tandoori Chicken Masala, because it listed the spices and it did not contain the artificial colors of the British Sharwood’s. Everest’s masala contains anistar (star anise) , asafoetida, black cardamom, black pepper, cassia*, cassia leaf (Indian bay leaf), chili, clove, common salt, coriander, cumin, dry ginger, garlic, mustard, nutmeg, pigeon pea (toovar dal), poppy seed, and turmeric. This is actually two recipes combined, together they made a filling and satisfying meal. If you wished you could serve the soup alone as a starter and the meatballs could be used separately as a hors d’oeuvre. You could also make the soup Vegan by using coconut or olive oil and vegetables broth. After Dinner Note: This dish passed the “must lick the bowl” test. 1. Combine all ingredients into a medium mixing bowl. Tip: This recipe makes enough for 3-4 people, but you may easily double it to feed more. In fact, you will probably want to. 2. Let the mixture rest, covered, in the refrigerator for at least one hour. 3. Form the meat into one tablespoon sized balls. Tip: Many people make their meatballs large, 2 tablespoons. I find these too hard to eat in one bite and prefer to make them smaller. 4. Arrange on an oiled baking sheet and broil on high for eight minutes. Tip: Line the baking sheet with foil for easier clean up. 5. Turn the meatballs over and broil for five minutes more, until browned and crispy on both sides. 1. Melt the ghee in a large soup pot and sauté the onions with the salt until they are starting to pick up come color. 2. Add the leeks and continue sautéing for 6 minutes more. 3. Pull the vegetables to the sides of the pot and add the garlic to the hole in the center. Saute the garlic until starting to be fragrant, about 30 seconds. 4. Add the curry powder to the garlic and sauté for 30 seconds more. Tip: Lightly frying the spices brings out their full flavor. 5. Stir the rest of the vegetables into the garlic and spices. 6. Add the ginger and one and a half cans of chicken broth and simmer, covered, for five minutes. 7. Stir in the lentils and simmer, covered, for ten minutes more. 8. Transfer the soup to a standing blender and process until smooth. 9. Return the soup to the pot and uses the last half can of broth to rinse out the blender jar. 10. Add the coconut milk and heat until the soup is warm. Tip: Do not bring the soup to a full boil after you have added the coconut milk. 11. Serve the soup in individual bowls garnished with the meatballs, a drizzle of coconut milk and the green onions.